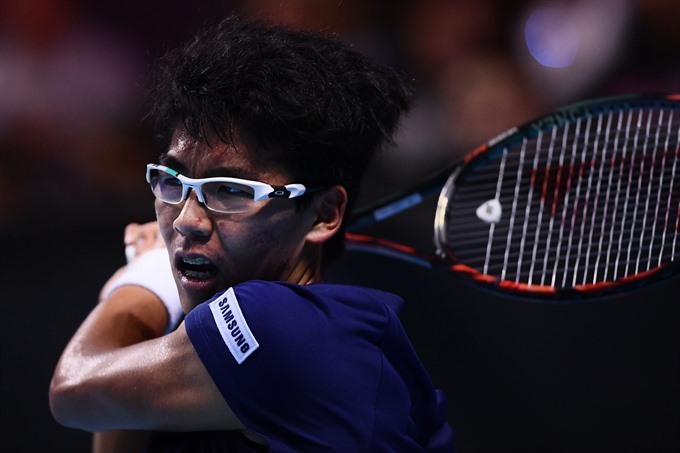 MILAN — South Korean Hyeon Chung became the first player to book his ticket to the semi-finals of the Next Gen ATP Finals in Milan on Wednesday. Chung beat Russia’s Andrey Rublev 4-0, 4-1, 4-3 (7/1) in their Group A match a day after rallying from a set down to get past Canadian Denis Shapovalov. Croatia’s Borna Coric beat Daniil Medvedev 4-3 (7/5), 2-4, 4-1, 4-2 but will have to wait until Thursday to book his berth after a fightback by the Russian who saved two match points. Coric was up two sets to one and 3-2, 40/15 and serving for the match, but thanks to the no-advantage scoring system, when he reached deuce, everything was on the line. One more point and he could force a tie-break, and from there a fifth set, but Medvedev could not save a third match point. "I think it was really physical," Coric said. "The first two sets were extremely tough." Coric will need to get two sets Thursday against Karen Khachanov to seal one of the two Group B spots in the semi-finals on the final day of round-robin play. Jared Donaldson is out of the running after a second loss, falling to Khachanov 4-1, 4-3 (7/3), 4-2. In the second Group A match, Shapovalov beat Quinzi 4-1, 4-1, 3-4 (5/7), 4-3 (7/5). Rublev can still make the semi-finals on Thursday when he plays Shapovalov but former Wimbledon junior champion Quinzi is out of the running.